Engineer Certified and Designed to hold ‘G’ size OXY / 45kg LPG cylinders side by side. 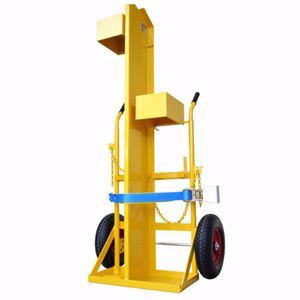 Certified 300kg safe working load. Lifting eye and flip up Gauge Guards to protect gauges whilst lifting via crane. Chains and keylock style keepers to retain cylinders. Baffle to separate bottles and lifting eye. Air filled 400mm diameter 4-Ply Pneumatic wheels. *The image below differs slightly to the actual trolley due to the larger LPG cylinder size.